Medicine and hospitals: A doctor's advice for being admitted to a hospital. What Should You Know Before Being Admitted to a Hospital? Doctor examining patient in hospital room. Photo by Thomas Northcut/Digital Vision/Thinkstock. How to survive your hospitalization. Most people feel that the equation to survive your hospitalization predominantly involves the expertise of your surgeon and the disease at hand. In fact, there is a silent factor that contributes to a phenomenon that is increasingly gaining attention in the medical community, administrative leadership, insurance agencies, and popular media: Death related to preventable errors. In To Err is Human, the Institute of Medicine concluded that between 44,000 to 98,000 Americans die each year as a result of medical errors. For comparison, deaths attributable to medical errors exceed those that die from motor vehicle accidents (43,458), breast cancer (42,297), and illicit drug use (17,000). 1. The central venous catheter. This is the gateway into your bloodstream to sample blood and deliver medications. These catheters can be lifesaving, but, in the same breath, they can also be life-threatening. These indwelling catheters can easily deliver a much needed medication to your body, but they can just as easily introduce a bacterial or fungal infection systemically. Before your hospitalization, look up your particular hospital: Most hospitals are required by the state to publicly display their Catheter-Associated bloodstream infection rates. Don’t be discouraged if your hospital is a “low-performer” when it comes to infection-control: most hospitals are still on a learning curve. Ask your doctor DAILY: “When can this catheter come out?” Be a broken record about it. The DAILY assessment of the need for a central venous catheter is a PROVEN way to minimize your risk. 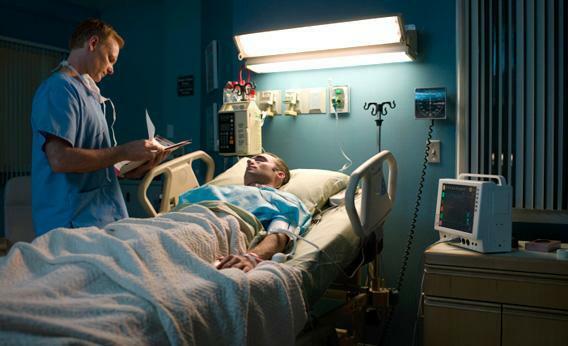 If your hospital is a low-performer, be knowledgeable about the best-way to avoid an infection. Before a health care worker accesses your central catheter, they should scrub the entry port at least 15 seconds (not 14 seconds) and let it dry for 15 seconds. Each and every time. Talk to your providers in the beginning and review your expectations and knowledge about this. There are graceful ways of talking about this, but at the end of the day, it’s your body and your risk should they cut corners in this evidence-based technique. Use your family members to be auditors in this practice. In 2004, the Joint Commission of Accredited Hospitals reviewed all deaths that occurred in a major academic hospital as a result of error. A breakdown in communication was found to be the root cause in more than 70 percent of the cases. The care of the hospitalized patient spans more than one team, one shift, one day. Your care plan gets passed from a morning team, to an afternoon team, and to a cross-covering evening team. The next day may introduce new people to your care altogether. By writing down what your primary team sets for you, you share in the authority for continuity in care. Review your care plan with each new staff that takes responsibility for your care. Consulting teams can quickly get on the same page if you are part owner in the care plan. Clear communication across multiple healthcare team members is commonly expected but, as in the Joint Commission’s report, should not be assumed. Expect post-operative pain. Setting this crucial expectation early and upfront is important. The body undergoes major adaptive changes following a big operation. Muscles quickly weaken, hormones shift, appetites suffer, and malnourishment exaggerates the insult to the body. Early rehabilitation hurts, but it also reverses all of these maladaptive processes. Adjust your post-operative pain medications as a means for rehabilitation, not as a means to remain comfortable in bed. Rehab early and often. If you are bed-bound, ask for a “Incentive spirometer” and use it every hour while awake. This is exercise time and crucial to your recovery. If it hurts to take a deep breath, use your pain medications to enable yourself. If you are knocked out, your dose is too high. Ambulate as early as possible. You will likely be miserable at the first attempt, but take courage: It will only get easier, and it’s good for your lungs. Ambulating (and simply getting out of the laying position) avoids lung collapse which can lead to pneumonia. Better oxygenation helps tissue healing which leads to faster recovery. 4. Maintain your sleep-wake cycle. Recovery from surgery often involves recovery from anesthesia. Sedatives used in the post-operative period helps keep you calm, but the sleep is not qualitatively restful. You may also find that there will be many obstacles to a normal circadian cycle (vital sign checks every four hours, noisy monitors, noisy neighbors, etc). As much as possible, keep your blinds open during the day and be exposed to natural light. Try to stay active during the day. Avoid frequent naps during the day lest you fall victim to delirium. At night, cover your windows to block out the night lights. There are not a lot of pharmaceutical sleep aids that are evidence-based. If one works for you, bring your home supply (as hospitals may not stock your particular medication). Many patients are surprised that they see their physician only once per day, often early in the morning. It’s hard to remember all your questions that has formulated throughout the day in a time-pressured setting. Write down your questions as they come throughout the day. Enlist the help of your nurse to get your answers. Your nurse will often be your best advocate. A nurse could even take the list of questions you’ve written down in advance and make sure the medical team covers your basic concerns. It’s okay to ask to speak to the physician at any time during the day. Hopefully, having these insights and strategic tools will help you navigate the complicated waters of being a hospitalized patient. Healing is hastened with the mindset that recovery is an active, not a passive process. Additionally, being a pro-active patient will often give you a necessary edge to avoid the mistakes, errors, and complications that many hospitals are still trying to figure out. This answer is not a substitute for professional medical advice. This answer is for general informational purposes only and is not a substitute for professional medical advice. If you think you may have a medical emergency, call your doctor or (in the United States) 911 immediately. Always seek the advice of your doctor before starting or changing treatment. Quora users who provide responses to health-related questions are intended third party beneficiaries with certain rights under Quora’s Terms of Service (http://www.quora.com/about/tos). What are the distinguishing characteristics of great doctors? What is the original purpose of the appendix and wisdom teeth?